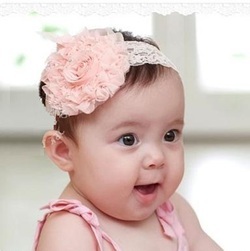 What could be prettier than flower hair bows in your little girls hair? 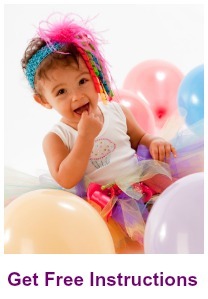 Whether it's a special occasion like the first day of school, birthday party or a family photo shoot. You can't go wrong with these pretty flowers made with ribbons to match your little girls outfit. And it will be a keepsake she'll treasure for years to come. It's often easier to use dog hair barrettes than straight up dog hair bows. This is because you can use a dog band to put a top knot or tiny pony tail into your pets hair and then just clip on the dog barrette. Puppy owners who like to change their doggies bling on a regular basis will love how easy it is to change out the doggie bow without totally redoing their pets hair-doo. We've included some bare dog hair barrettes for those of you who want to make your own dog bows. 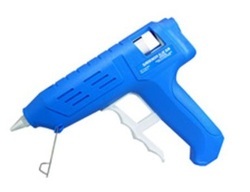 If you don’t yet own a hot melt glue gun you're going to want to get one before you start making hair bows. Honestly, these things are so useful you'll wonder what you ever did without one. A word of warning before you buy. Be sure you get a HOT melt glue gun and not just a low temp one. It can be a dual temperature gun but you want a HOT option. Yes, this does mean you'll have to be a bit more careful to avoid burning your fingers. However, because the glue is hotter it's thinner. It penetrates your ribbons better and you can use less. This is important, not from an expense point of view because glue sticks are cheap, but for esthetics reasons. Less glue, less bulk equals a cleaner, nicer hair bow. 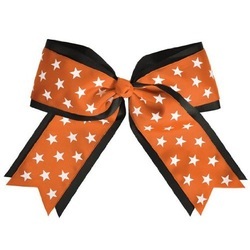 Cheerleading hair bows are an important part of your team uniform. They need to be impressive, durable, match your uniform and stay where you put them. Making your own cheer bows is the best way to get exactly what you are looking for. But we know that's not always practical. So we've assembled this selection of cheerleading hair bows for you. 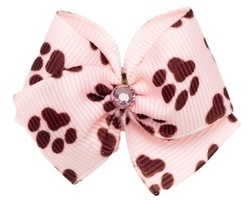 Hair bows for dogs are gaining in popularity all across the country. Folks have always enjoyed how their little darling looks when they come home from the groomers with bows in their hair. Now, they are realizing how easy it is to have that look all the time either by learning to make hair bows for dogs or buying them ready made. Now if you want to make your own dog bows, we've got you covered in our training. It's simple and it's the best way to get fancy hair bows for dogs CHEAP. At the bottom of the page we share one of our tutorials with you for free. We hope it helps you to spiff up your doggie. Make Hair Bows or Buy Them! You want to make hair bows but you don’t know if you're going to enjoy it or not. So you don't want to invest a lot of money (or time) into this project until you know for sure it's the right hobby for you. We get that, don't worry. 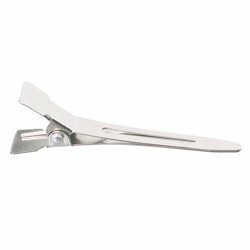 Price Alligator Hair Clips Here! When making your own hair bows you're going to need alligator hair clips and lots of them. As well as some barrettes, hair bands and maybe a few combs too. If you're just learning how to make hair bows all this stuff may sound a little overwhelming to you. You may be wondering if you want to I use alligator clips with teeth or without? 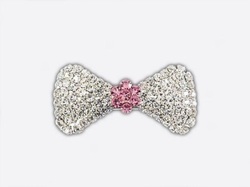 Or, is a barrette better for this bow or a hair band? 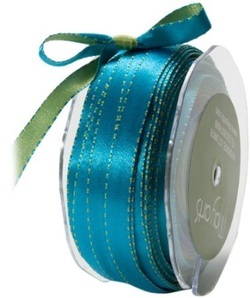 Grosgrain ribbon is your go-to ribbon for making hair bows. Especially when you are learning. Because it's sturdy, inexpensive and forgiving to work with. Easy to clean with a swish in some warm soapy water, grosgrain is a great ribbon to choose if you are making hair bows for little girls. It never bleeds so you can safely use multiple colors together in one project. This makes it perfect for cheer bows because we know they're gonna get rained on. Shiny, soft and smooth satin ribbon makes lovely and interesting hair bows. Because of how it's made satin has a shiny side and a dull side. This two tone nature insures depth to your creation. Claim Your Free Hair Bow Instructions Now! Manufacturers have played up this two tone effect by making many satin ribbons different colors front and back. 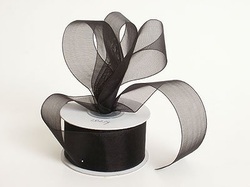 Organza ribbon is the lightest of the hair bow ribbons. 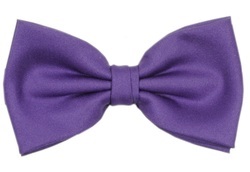 Crisp, with lots of body but not as stiff as taffeta, organza makes playful and elegant bows. Claim Your Free Hair Bow Lesson Here! Very sheer and plainly woven it is traditionally made from silk. Today most of the organza you see in stores is made from a synthetic fiber most likely polyester or nylon.